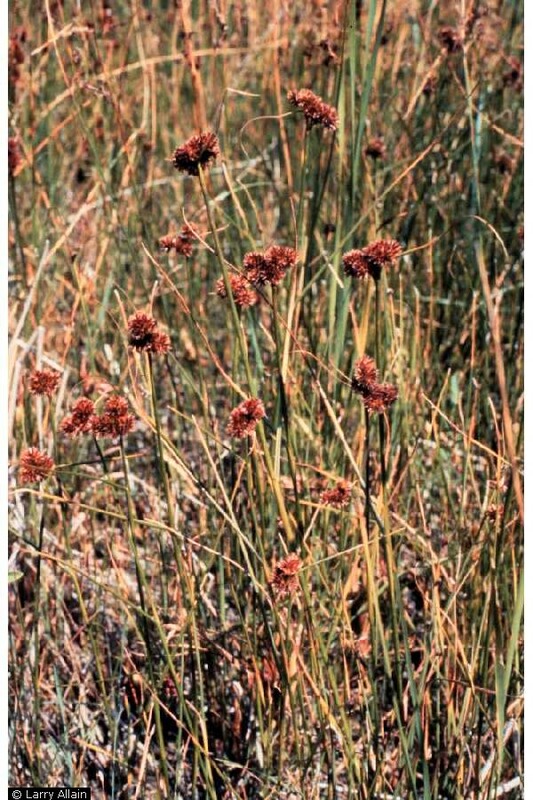 Juncus torreyi.Larry Allain @ USDA-NRCS PLANTS Database (Accessed 5/2014). Juncus torreyi is a perennial rush, stems 40 cm to 1 m tall, stiff, singly from along rhizomes with tuberous swellings. Leaves alternate, 2-5, sheath margins pale, membranous, lobes at top 0.2-0.5 cm long, blade round in cross section with horizontal partitions (septate), 10-30 cm long, 0.1-0.3 cm wide. Flowers about 0.5 cm, petals slightly shorter than sepals, narrow, sharp-tipped; inflorescence dense, of 2-10 round, greenish or dull brown heads 1-1.5 cm wide, each with 25-100 flowers. Fruit capsule slender, about 0.5 cm, 3-sided, sharply pointed; July-Oct.
Habitat: Moist to wet sandy soil, open habitats, soil pH 4.5-6.5 (USDA, NRCS 2010). A prairie plant.